The Wabbit and Lapinette waited patiently for Skratch the Cat Burglar and Robot to join them. "What you both so long?" enquired Lapinette. "We were signing autographs at the stage door," said Skratch. "You predicted a riot," said Lapinette, turning to the Wabbit. "In the old days we would have had to scurry out of town before the trouble started," nodded the Wabbit knowledgeably. "What on earth for?" said Lapinette. "Having seen the play," said the Wabbit, "the apprentices would riot against social injustice and demand cheaper carrots." "I think I can hear them now," said Lapinette and she twitched her ears. Everyone looked round and round then laughed. "Nice flowers," said the Wabbit. "Where did they come from?" "An unknown admirer," said Lapinette. "The Duck of Milan?" smiled the Wabbit. "Wabbit, they came from Giuliano Pisapia, and it's the Mayor these days, not a Duke," said Lapinette. "Oooh, where's my flowers?" asked the Wabbit. "You can have these," said Lapinette. 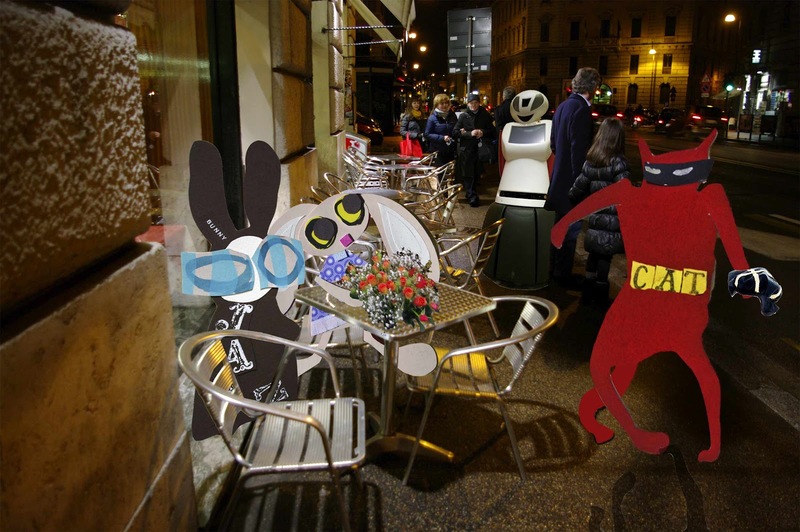 "No, I'd give all my fame for a pot of aperitivo," said the Wabbit. "What about you Skratch?" "Latte caldo of course," said Skratch. "What's your poison?" asked the Wabbit of Robot who was making a grating sound. "Rubbing alcohol and cotton buds," said Robot.